EXO's Kai Receives A Love Call From Rihanna's Makeup Brand Fenty Beauty! A Fenty x Kai collaboration may just be in the works! It all started when international EXO-Ls came up with the brilliant concept of having the EXO member as the face of Rihanna’s makeup line Fenty Beauty, then proceeded to flood the social media platform with Kai’s past photoshoots and masterfully done fan-edits in all his sun-kissed glory. Not long after, the hashtag #FENTYxKAI began trending. With his chiselled features, glowing complexion and magnetic aura, one can definitely see why the 24-year-old would make the perfect model for the Rihanna-fronted brand, which has always been about championing inclusivity and diversity. Just imagine how glorious our resident melanin king would look rocking Fenty Beauty’s iconic Body Lava all over his gorgeous bronzed skin! With Kai onboard, it would not only make a huge turning point in Asian representation, but also help to break out of traditional gender roles by normalising makeup for men (they even have a whole video about “Makeup For Men” in their latest upload on YouTube, and that’s saying something). And honestly, we’re all here for that. Turns out we’re not the only ones; the team behind Fenty Beauty has quickly taken noticed of this ongoing movement and wasted no time in sliding into the K-pop star’s DMs. It seems like they’re pretty serious about reaching out to Kai, even going the extra mile of following EXO’s manager on Twitter (@Groovechaja) – and we spied that the latter has also followed them back! From the looks of it, a #FENTYxKAI collaboration wouldn’t be too out of the question. 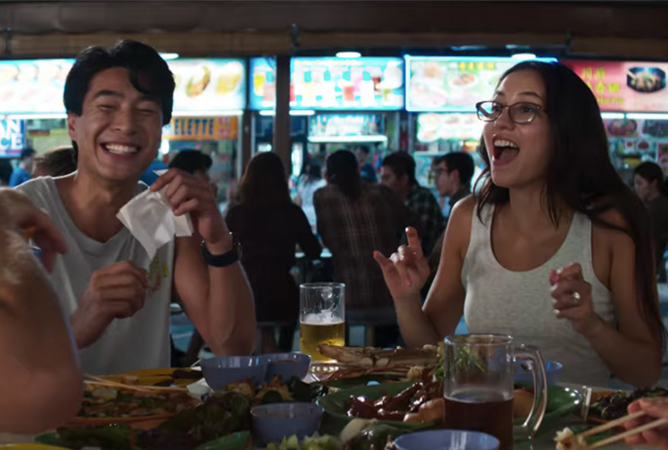 Remember the time when we welcomed the cast of Crazy Rich Asians to our sunny shores? Well, now we get to retrace the steps they took as characters of the film and see our beloved Singapore in a whole new light. Take a trip down a cinematic memory lane as we re-introduce you to familiar locations that are now a part of movie history. Having housed many notable personalities from Queen Bey to Queen Elizabeth II, it’s no wonder the Raffles Hotel (specifically the gorgeous Presidential Suite) was chosen as Rachel and Nick’s home away from home during their stay in Singapore. Opened in 1887, this heritage hotel in the heart of our city continues to be an icon for Singapore; giving tourists and locals the most luxurious experience. Good to know: Raffles Hotel is home to the Singapore Sling. As the hotel is currently undergoing a makeover, guests are invited to the pop-up Long Bar to enjoy a cup of its signature drink. Raffles Hotel will re-open its doors in 2019 with a more modern concept, complete with improved facilities and new dining establishments. The Raffles Hotel is located at 1 Beach Road, Singapore 189673. 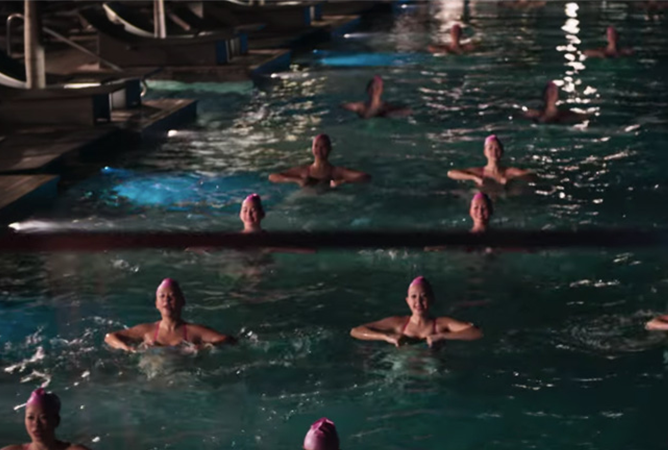 Yet another iconic attraction in Singapore, the infinity pool at Marina Bay Sands plays host to the Crazy Rich Asians cast for a late-night aqua aerobics session. As the world’s largest rooftop infinity pool, it is helmed as the most Instagrammable spot in Singapore and was once Katy Perry’s press conference venue during her visit in 2010. Good to know: Entry to the infinity pool is restricted to only registered hotel guests. However, the Marina Bay Sands SkyPark does have an observation deck which offers a breathtaking panoramic view of Marina Bay. Entry ticket is priced at $23 for adults. The Marina Bay Sands SkyPark & Infinity Pool is located on level 57 of the hotel. Entrance to the SkyPark Observation Deck is at the exterior of Hotel Tower 3 at 10 Bayfront Avenue, Singapore 018956. As much as the Crazy Rich Asians enjoy dining in fancy restaurants, not even the most expensive of meals can beat our good ol’ laksa and nasi lemak. The newly-renovated Newton Food Centre gets special mention as the supper venue for Nick, Rachel, Araminta and Colin, which offers an eclectic mix of local delicacies at wallet-friendly prices. Good to know: Newton Food Centre is also home to two Michelin Bib Gourmand 2018 recipients, Alliance Seafood and Heng Fried Carrot Cake. Be sure to avoid the usual eating hours if you want to try them out! Newton Food Centre is located at 500 Clemenceau Avenue North, Singapore 229495. 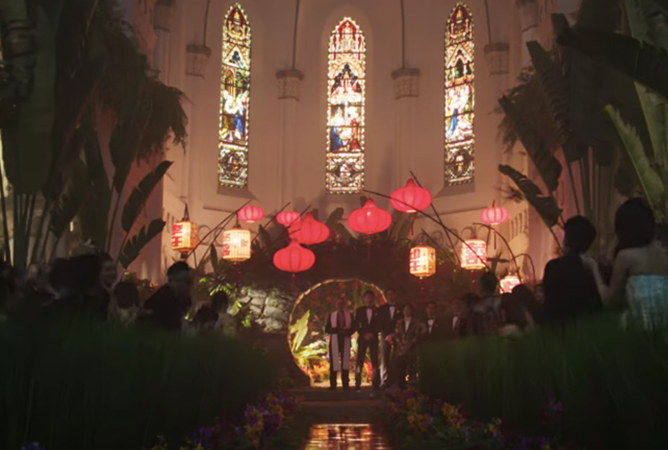 Does that sprawling mansion where Goh Peik Lin runs to embrace Rachel actually exist in Singapore? Why, yes, it does – sans the gilded look it’s given in the film. This now-famous property is currently up for sale so if you’re a secret Crazy Rich Asian, you might want to consider this your spanking new home! Good to know: If you’re not in the market for a new home, not to worry. As the gates are sometimes unlocked, you can still pop in for a quick look or that must-have Instagram snap (#crazyrichlikepeiklin). The mansion is located at Cluny Park; nearest MRT station is Botanic Gardens. 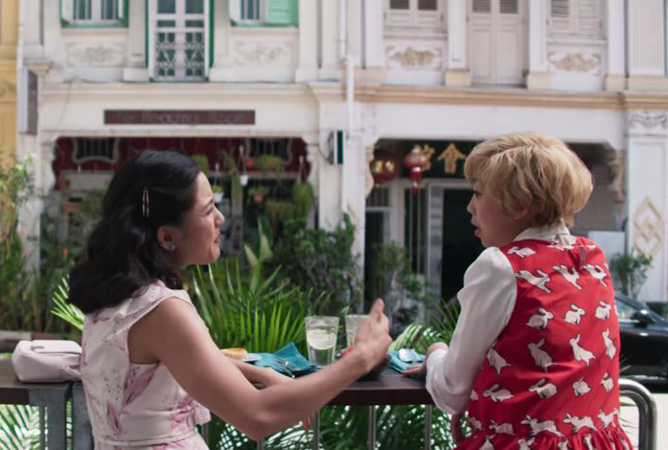 Featured in the film as the backdrop to Eleanor Young and her power suit, Ann Siang Hill is a heritage district where the old and new collide. Though widely known for its cool and trendy cafes, Ann Siang Hill is also home to historical landmarks like the Al-Abrar Mosque, which has been at the same spot since the mid-1850s. Good to know: Craving for a local bite at this culturally charged location? The recent recipient of the 2018 Michelin Bib Gourmand, The Coconut Club, is the place to visit for its traditional nasi lemak and chendol. As it’s highly popular during lunchtime, head down early to beat the crowd! Ann Siang Hill is located next to Club Street. To get there, take the Downtown Line to Telok Ayer Station and take a 7-minute walk in from the main street. The Coconut Club is located at No.6 Ann Siang Hill, Singapore 069787. Located amongst the quaint shophouses on Bukit Pasoh Road is the famous seafood restaurant, Humpback. The alfresco bar table facing the road was the setting for Rachel and Peik Lin’s heart-to-heart, and also where Peik Lin delivered her iconic line, “Bawk, Bawk, B***h”. Surrounded by good food and good company, Humpback’s a great spot to unwind on a weekend or for a night out with the gals! Good to know: If you’re a huge seafood fan, be sure to order a serving of their signature fresh oysters. Keep an eye out for their happy hour oysters where you’ll get to enjoy four different types of oysters at $3++ or $2++ each! Humpback is located at 20 Bukit Pasoh Road, Singapore 089834. To get here, take the North East Line and stop at Outram Park station. Head to Exit H and walk along the shophouses till you reach the restaurant. Known as the Convent of the Holy Infant Jesus back then, CHIJMES has since evolved into a heritage building that houses many dining options. The Gothic-style chapel has also been repurposed into a function hall where weddings are a common sight – including Colin and Araminta’s lavish wedding scene! Good to know: Due to the popularity of the location, CHIJMES Hall always seem to be undergoing event prep and is mostly never opened to the public. But not to fret, you can still view the intricately designed architecture from the front entrance of the chapel. CHIJMES Hall is located at 30 Victoria Street, Singapore 187996. 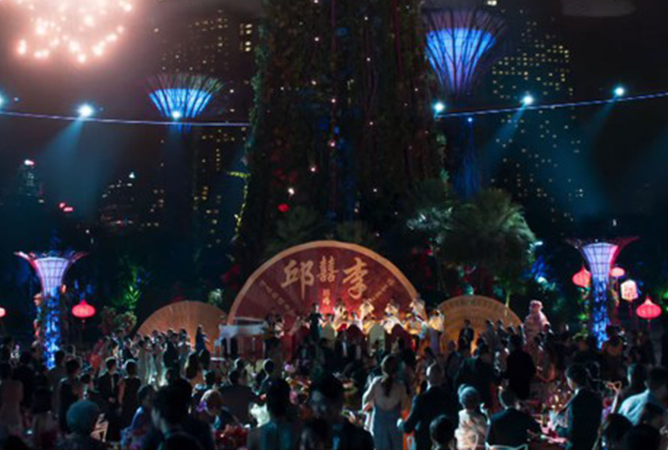 As another one of Singapore’s go-to tourist attractions, Gardens by the Bay was what the National Parks Board envisioned for a City in a Garden. The futuristic-looking enclave is home to gigantic artificial supertrees as well as two domed conservatories, namely the Flower and Cloud dome. This visual spectacle was chosen as the venue for Colin and Araminta’s wedding reception. Good to know: With exceptions to the domed conservatories, entry to the Supertree Grove is free and visitors can enjoy Garden Rhapsody, a light and music show that takes place every evening. Alternatively, if you’re in for a more spectacular view, you might want to consider getting an $8 ticket up to the OCBC Skyway where you’ll get to walk the 128-metre-long aerial walkway and find the perfect spot to ‘gram your experience. Gardens by the Bay is located at 18 Marina Gardens Drive, Singapore 018953. If you’re taking the MRT, alight at Bayfront station (for Circle and Downtown Line). Take Exit B and follow the underground linkway till you reach the exit. Once you’ve exited the linkway, cross either the Dragonfly Bridge or Meadow Bridge to enter Gardens by the Bay. Catch Crazy Rich Asians in cinemas now! The powerhouse pop rebel might have charmed Singapore once before during her maiden performance at 2016’s Singapore Grand Prix, but on Halsey’s first recent headlining concert tour here, she proves that she’s a definite mainstay in today’s music climate. 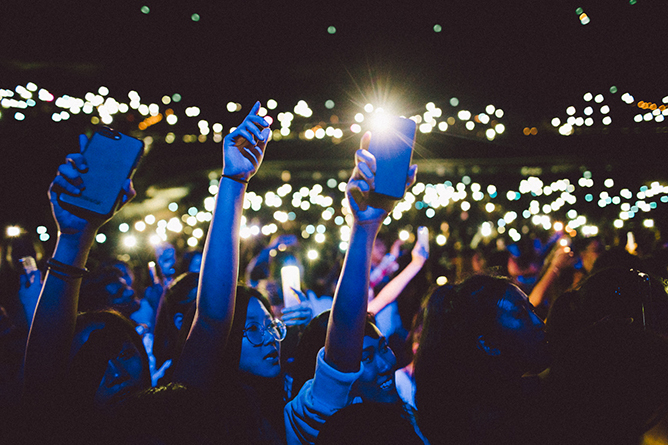 You’ll know when you’re at a Halsey concert. On the list of things to look out for: dyed hair (preferably in a shade of blue), oversized streetwear and rainbow flags; and those trademark items were on full display at The Star Performing Arts Theatre, proudly adorned by the many young fans buzzing in anticipation of their queen. But those signature fan honours are also a testament to the kind of celebrity Halsey is: influential, inspirational and unapologetically honest. Following opener Niki’s short but sweet set of R&B-tinged tracks, it was the spoken-word introduction of Halsey’s ‘The Prologue’ that echoed throughout the venue in response to deafening screams, before she promptly followed with the hard-hitting ‘Eyes Closed’ as a mini-mosh pit furiously formed near the front of the stage. True to her appeal of being a shapeshifting chameleon with her style, Halsey opted for a yellow crop top and baggy jeans combination complete with a chain linked on her pockets – reminiscent of early 2000s Avril Lavigne, coupled with the occasional Britney-esque gyrating dance moves and her signature mic flips in between verses. The main lady herself referenced the throwback theme, proudly announcing that “this show’s gonna be dirty and punk as f***. We are doing it old school!” before belting out ‘Roman Holiday’, off her Tumblr-beloved debut album Badlands. Both older and newer songs in her catalogue played relentlessly during the next 90 minutes, with Halsey ensuring to drop in a couple of personal anecdotes with her legion of followers along the way. Whether it was shouting out the LGBT community on ‘Strangers’ (“We are safe here so let’s dance!”), advocating self-love on ‘Hurricane’ (“This song is a reminder that you don’t belong to anybody but yourself”) or admitting to not having everything figured out in her life before a stripped-back rendition of her #1 hit ‘Closer’ (“I’m 23 and I still don’t know what I’m doing, but it feels like we grew up with each other”), every moment felt refreshingly unrehearsed and added to the overall concert experience. 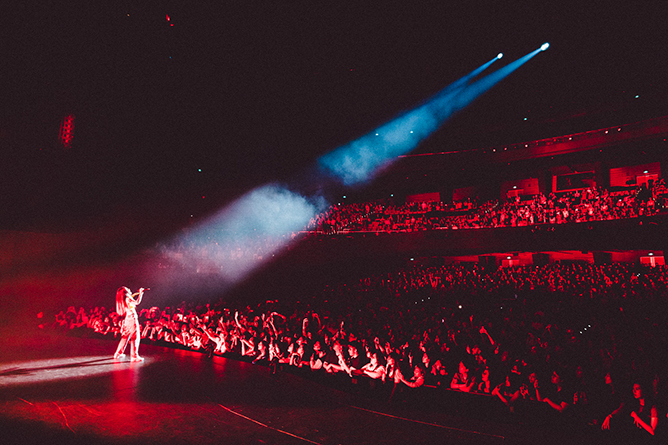 Between rushing down to the crowd during ‘Colors’ and showcasing a more vulnerable side on ‘Sorry’ – that elicited a sea of swaying phone lights – Halsey proved that she’s truly got the mettle of a bona fide pop star in the 21st century. And by the time she re-appeared on stage for her encore of the belty ‘Bad At Love’, she had every audience member in the palm of her hand singing loudly along, with the backdrop of flame bursts, cinematic smoke and her backing band closing the night while she waved her byes and bade farewell (for now). As Halsey sings on ‘Heaven in Hiding’, “I can put on a show”. And trust us when we say she can and will however she wants to. Special thanks to Hype Records and Universal Music Singapore for the invites! From K-pop princess to a solo star in her own right, the Girls’ Generation member is ready to make a name for herself beyond the world of Hallyu. Following her illustrious decade-spanning career in one of the biggest K-pop girl groups, Korean-American singer Tiffany Young made the decision to part ways with longtime label SM Entertainment for a shot at solo fame. Her first original post-SNSD release ‘Over My Skin’ came a couple of months after her departure – a sensual, ’90s-inspired pop ditty that steers away from K-pop’s penchant for bright melodies and bubblegum hooks. Her sultry vocals take centre stage here, a testament to her newfound maturity as she sings of inner confidence and female empowerment. But what really made us view the songstress in a new light, is her name in the songwriting credits alongside Far East Movement, Khwezi, Kev Nish and Rachel West. “I’ve been learning how to write over the past year, and I’m having so much fun with it,” she explains over a phone interview. “It’s a time of growth for me, and it’s nice to be able to come out and show what I’ve been working so hard on.” Not many K-idols are able to take control of their own creative freedom, with most of their tunes meticulously crafted in big-name studios instead. Not to discredit them of course, but we’re very proud of Tiffany’s upgraded composing chops and the trailblazer certainly has the potential to carve out a successful career as a burgeoning singer-songwriter. However, she’s never one to completely detach herself from her girl group roots either. When asked what gave her the confidence to be the Tiffany Young we see today, she spares no hesitation in giving her beloved bandmates a shoutout. Her latest single, for instance, was also largely driven by her time in Girls’ Generation and the sisterhood between them. “Last year was our 10th anniversary and that was such a great moment for us to make sense of what Girls’ Generation stands for. As females, we’ve been together for 10 years and I want to continue the message of always loving and supporting your girlfriends. I hope that women of all ages could feel fabulous listening to it,” she shares. She makes her intentions loud and clear between the lines, where female empowerment is a major theme throughout the song. “When I wear something, I wear it for myself and not because I want a guy to look at me. If I wanna show skin, I show skin and there’s nothing wrong about it. This song is really created around that conversation.” It’s a bold move that might not work well in the rigid landscape of K-pop, but it’s Tiffany we’re talking about – and she has never been shy to speak up for herself. ‘Over My Skin’ is the result of Tiffany truly coming into her own as a soloist, and it couldn’t sound better. Tiffany Young’s latest single ‘Over My Skin’ is now available for purchase and streaming. At 21, actor Koudai Matsuoka appears wise beyond his years. We caught up with the Japanese actor when he was in town to commemorate the launch of Japan Park Singapore, where we discovered he’s more than just boyish good looks. Apart from boasting killer acting chops, this rising star is also equally talented in the dancing department. Oh, and he’s a well-known K-pop stan – which scored him bonus points in our books. Here are five reasons why you’ll be crushing on Koudai Matsuoka in no time. #1 He’s a fan of our local food. Ask any celebrity who comes to our little red dot about their favourite Singaporean cuisine, and chances are chilli crab would most likely top the rankings. Aside from the popular dish, Koudai also gave special mention to other local delights such as chicken rice and bak kut teh. Next on his must-try list? Char kway teow! #4 He’s a huge fan of EXO’s Kai and Bruno Mars. Did you know that the chap’s a fanboy of EXO’s resident dancing machine, Kai? He even knows the choreography to ‘Growl’ – check out his flawless moves in this 2015 cover he uploaded on Twitter. We’re certainly looking forward to that, but in the meantime, fans can catch him in the upcoming stage play of Rurouni Kenshin in October – a character that’s “different from my previous roles”. And if his previous roles are any indication, Koudai definitely has the potential to make it big.